It may be the "most wonderful" time of the year--but it's also the most dangerous time of the year. 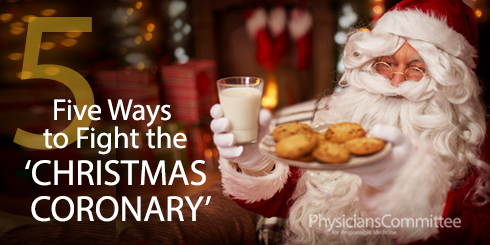 Have you heard of the "Christmas Coronary"? There is a two-week spike in cardiac deaths between Dec. 25 and Jan. 7. But there are steps you can take now to keep your heart healthy this holiday season and into 2017 and beyond. Hold the Holiday Ham. Processed meats--like holiday hams and "gift" baskets packed with sausage and pepperoni--are dangerous to your heart. Just 50 grams of processed meat a day--about a slice or two of ham--increases the risk for death from heart disease by 24 percent, not to mention its effect on colon cancer risk. Empty the Egg Nog. Traditional egg nog is loaded with eggs and high-fat dairy products. People who consume the most eggs can increase their risk for heart disease by 19 percent. For people with diabetes, the risk for developing heart disease from eating eggs can increase by 83 percent. The dairy in egg nog is equally dangerous. One study found that for each glass of milk consumed per day, the risk of dying from heart disease increased. Chuck the Cheese Ball. Cheese is the No. 1 source of saturated fat in the American diet and can increase the risk of early death from heart disease. Cheese is also a leading source of sodium and has as much cholesterol--ounce per ounce--as steak, raising the risk for heart disease. Prepare a Plant-Based Plate. A recent study found that those following a plant-based diet had lower mortality rates from heart disease, compared to omnivores. Try our holiday menus. Kickstart Your New Year. Sign-up for the 21-Day Vegan Kickstart that begins Jan. 1.